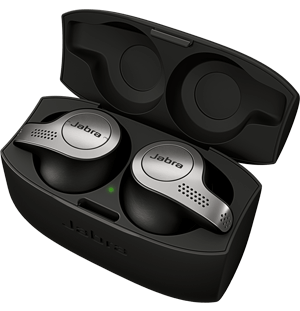 The Jabra Sound+ app is the perfect companion to your Jabra headphones. Customize your sound, so your music and calls experience always suits your surroundings. Personalize your experience by customizing the way Sound+ delivers your sound and how it looks. Choose your preferred voice assistant from Amazon Alexa, Siri®, Google Assistant™ and more. * Your headphones come with a 2-year warranty, which can be activated by registering your device in the app. Enjoy unrivalled freedom and unbeatable sound with wireless headphones from Jabra. Compatible with a wide range of devices, you're sure to find a pair that are simply perfect for your lifestyle. Whether you're sitting at desk or in motion at the gym, our wireless headphones are designed to stay put. Always reliable, the secure fit is combined with superior comfort for all-day use. 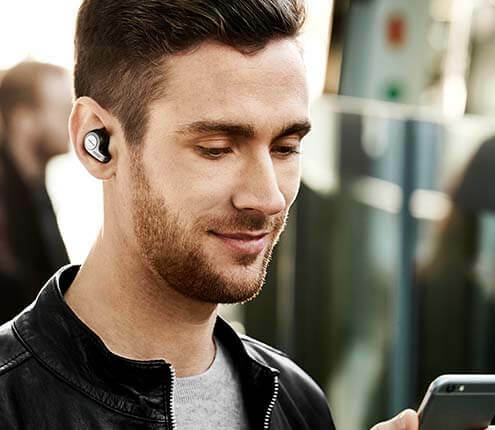 You'll find a long-lasting battery on all models too, from the Jabra Elite Sport to the Jabra Elite 65e, so you'll never run out of power when you need it the most. Exceptional audio is guaranteed with our headphones and headsets, thanks to noise-cancelling technology filtering out unwanted background noise. Stay focused and maintain your concentration, whether you're trying to beat your personal best on an outdoor run, facing a tough workout routine or making an important call in an office.